UNPO staff and delegation members were a strong presence at the 3rd Session of the Forum on Minority Issues, which focused on effective economic participation. Two UNPO staff members led a delegation of over 20 representatives of 11 minority groups to participate in the Forum, which took place over the course of three days at the Palais des Nations in Geneva, Switzerland. Represented groups included Assyria, the Ahwazi Arabs, Balochistan, the Degar Montagnards, East Turkestan, the Khmer Krom, the Iranian Kurds, the Mon, the Ogaden, the Oromo, and West Balochistan. Monday, 13 December marked the first unofficial day of the Forum. UNPO staff and Member representatives attended an informal preparatory workshop hosted by the UN Office of the High Commissioner for Human Rights (OHCHR) and Minority Rights Group International. Speakers at this session presented important information regarding the purpose of the Forum, best practices for engagement with the Forum, and general information about the structure of the UN system surrounding the Forum. Independent Expert on Minority Issues Ms. Gay McDougall created a welcoming atmosphere at the workshop, asking all present to introduce themselves and giving attendees the opportunity to speak openly about the present situation of their minority groups with regards to economic participation. UNPO delegates representing the Iranian Kurds, the Assyrians, the Ahwazi Arabs, and the Khmer Krom as well as Ms. Maggie Murphy of the UNPO Secretariat took this opportunity to brief Ms. McDougall on their particular country situations. Tuesday, 14 December marked the official start of the 3rd Session of the Forum. After opening statements by the Independent Expert and the Chair of the Forum, pre-selected participants were given an opportunity to speak under each agenda item, followed by a general discussion in which all participants were invited to speak. This discussion was kicked off by a member of the UNPO delegation, Mr. Hunde Dhugassa Gabissa, representing the Oromo of Ethiopia. Representatives from the Degar Montagnard and the Ahwazi Arabs also contributed strong interventions on this day. UNPO and Minority Rights Group International co-hosted a side-conference on Tuesday afternoon, focusing on the exploitation of natural resources in minority regions. Maggie Murphy of UNPO chaired the event, during which representatives of three minority groups provided valuable insight into the unique barriers they each face in asserting ownership and control over their natural resources. The second official day of the Forum saw a great deal of activity, with the remainder of the UNPO delegation signed up to speak under the day’s three agenda items. Representatives from Assyria, the Iranian Kurds, the Mon, the Khmer Krom, East Turkestan and the Ogaden all delivered strong statements on Wednesday. Representing West Balochistan, Ms. Nasrin Sulemani was also on the roster to deliver an intervention Wednesday. Unfortunately, Sulemani’s intervention was sidelined by time constraints, which were exacerbated by the large number of state delegations intervening with unscheduled statements, some more than once. The full text of her intervention can be found online. Highlighting broad issues underlying many of the Member statements, UNPO’s Lisa Thomas delivered an intervention Wednesday afternoon. Thomas addressed two key areas not sufficiently dealt with in the draft recommendations; namely, the development of natural resources in minority regions as well as the ability of minority groups to self-identify in their preferred manner. The Chair of this Forum Session, Professor Gita Sen, and the Independent Expert on Minority Issues Ms. Gay McDougall delivered closing remarks on Wednesday evening. 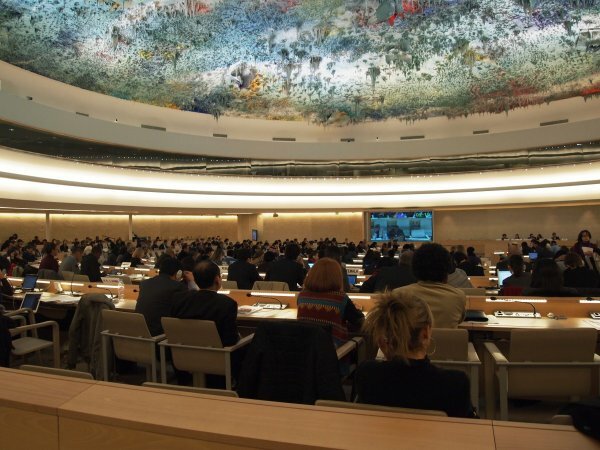 The draft recommendations, which formed the basis for discussions during the Forum, will now undergo a final set of revisions before being presented to the Human Rights Council in 2011. UNPO hopes that the mostly excellent recommendations will gain further strength from the input provided by minorities and advocates during the Forum, and furthermore that the Human Rights Council and UN Member States will undertake the task of implementing these recommendations. Click here to see video footage of Mr. Makarar Thhai's statement to the Forum on behalf of the Khmers Kampuchea-Krom Federation (KKF).